In a bit of other news, my e-book, Flips Folds Ribbon and String was featured in the review section of Paper Creations Summer 2014 issue - my book is their first ever e-book review - very exciting! Hope your week(s) have been wonderful and productive, too. Great post Helen, I love to read about your farm. Your lolaBfly is great, I admire the way you can play with tangles that when I see your drawing I just see a Butterfly and only afterwards I think oh yeah its done with Lola. Beautiful! how exciting to have your e-book reviewed! Love your tangles! Although I do not have house-cow envy, i do love Honey and would like permission to use that photo as an inspiration for a drawing or painting. Our art league this summer in WI up near Lake Superior is having a "cow theme" show to raise money for the club. Hoping you will say yes, as it's more fun to use photos of cows that have history and meaning. Loving all the news from the farm. Can I come live with you? lol Absolutely love your Lola Butterfly. As for 'Honey', she is gorgeous. Sounds like you are super busy out there and we appreciate all the time you give to create new tangles. Have a wonderful day Helen. I love all your posts Helen - you are hilarious!! Honey is so sweet!!! Your work as always - AMAZING!! Always enjoy your posts. I do not live on a farm, and never have, but does bring back some memories of growing up and going to my grandparent's farm. Sounds like you have some really big plans. Hope they come to fruition. Love the Lola butterfly. If you have time in all your endeavors, check out my tile for this week's Diva Challenge. I used Scroll feather. Really like this tangle and tried a little something different with it. Unfortunately for my husband, I always have big plans that involve him digging. hahaha! Your Lola drawing is gorgeous, but this time the favorite on this blog is your calf. You are ambitious, but a lot of work to do on a farm before winter. Here in the midwest, USA, it's supposed to be spring - warmer days, sunshine. Well, mother nature is having trouble shaking the hard winter we had. Spring is slow coming. Honey is such a cutie! 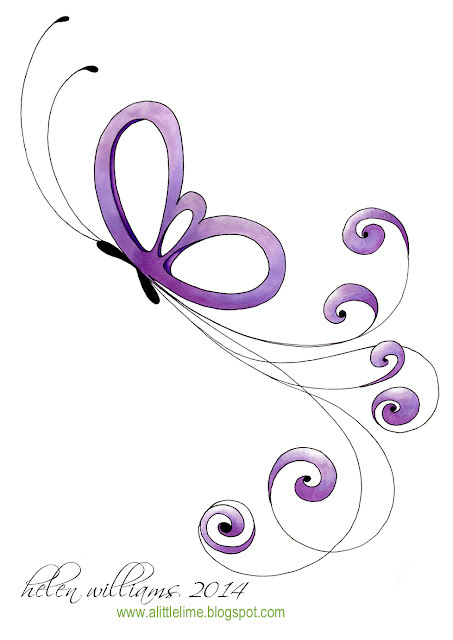 And I love the butterfly! We're just heading into the cooler weather - it's been a lovely Autumn.Probably a straight slide into winter for us now, though. Love seeing your farm pics! Sensational butterfly! So interesting to see what you're doing on your farm. We also farm and it's spring here so we're busy planting and getting ready for summer and selling at Farmers Market. We have a high tunnel - 20' x 96' full of strawberries that will be ready to start picking next week - yikes!! And a new tunnel - 20' x 48' that will be all tomatoes. It's a learning experience for sure and hard to do any drawing when we're so busy!! I always love to see your work - it is soooo inspiring!! I have your e-book and I love it. I'm taking it to my annual cousin reunion as one of my cousin's is starting to do a lot of tangling too. Enjoy your fall days! !